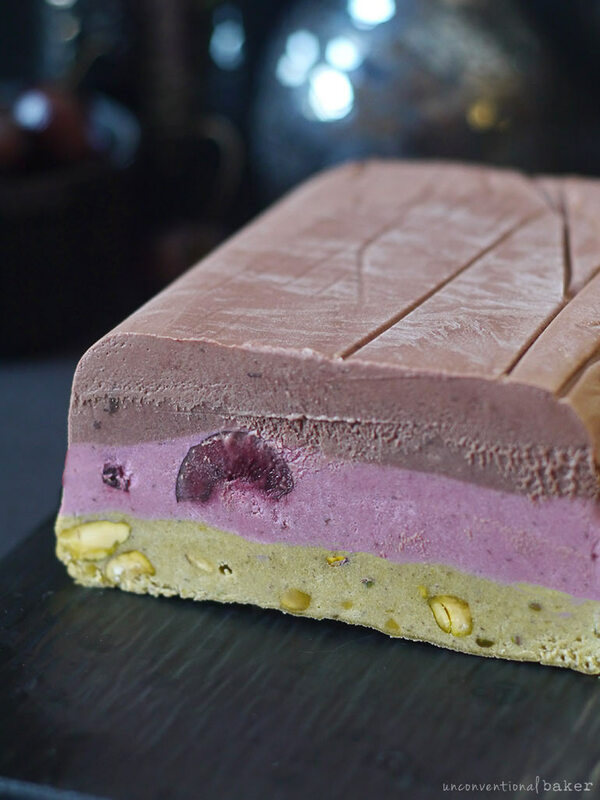 A layer of chocolate-cherry ice cream, a layer of cherry-almond, and a layer of pistachio make for a lovely special treat known as spumoni (or spumone) — a delicious classic Italian molded ice cream dessert (not unlike Neapolitan). 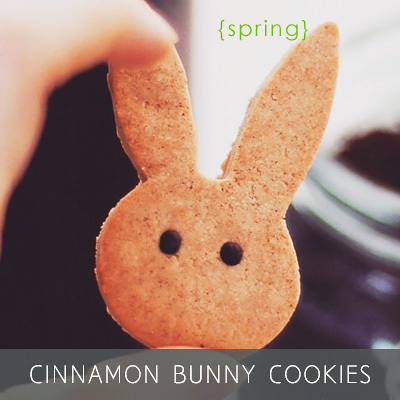 I got the idea to make this treat from Janel, the videographer for Unconventional Baker. She sent me a pic of a spumoni cake she’d seen in a shop and asked me if I thought something like that could be made “unconventional.” That was my first time hearing of spumoni, and of a dessert containing these particular three flavors all at once, but after reading a bit about it I thought hey, sounds interesting and I like ice cream, so why not. And so it formed the inspiration behind this recipe. 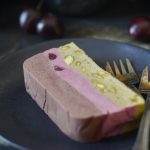 After looking around at some of the best spumoni ice cream recipes (traditional ones, I mean) while assessing what’s involved I have to admit that I had my doubts about how good these very different flavors would be all together. I mean chocolate + cherries = delicious. Cherries + almond = lovely. Chocolate + pistachio = yes please. Pistachio + almond = very complementary. 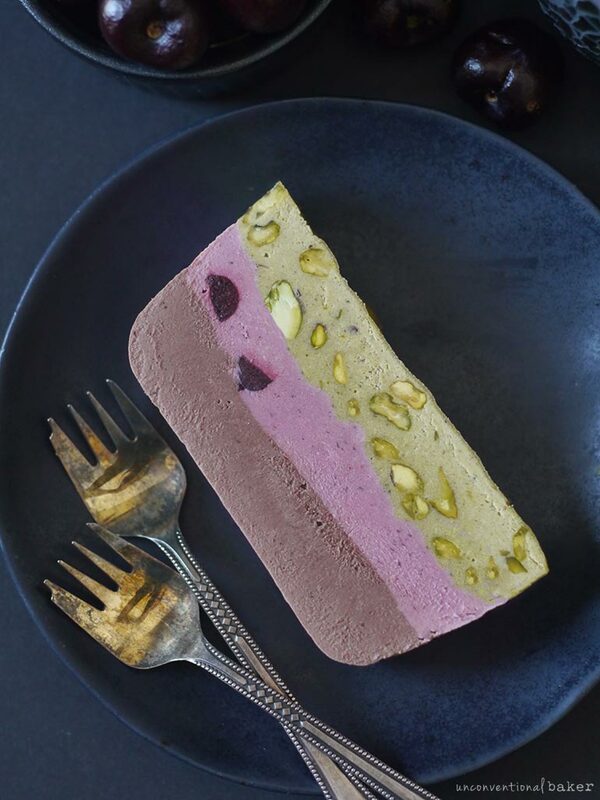 But who on earth makes a chocolate, cherry, almond, pistachio dessert all at once?! :D Is it just me? Then I gave it a go, and you know what — it’s a classic treat for a reason. Somehow all these flavors really come together in one bite. Surprising. One small note about the recipe here vs. the photos: you’ll notice in the recipe below that the cherry and chocolate layers are reversed. So photos show chocolate first, cherry next, then pistachio. But if you follow the recipe below it will be cherry first, then chocolate, then pistachio. The reason I flipped them is because a) practically it makes for one less dirty bowl to wash (got your back there! ;) ), and b) because the cherry layer with the big chunky cherries in it is a bit “heavier” so it actually sets better first. 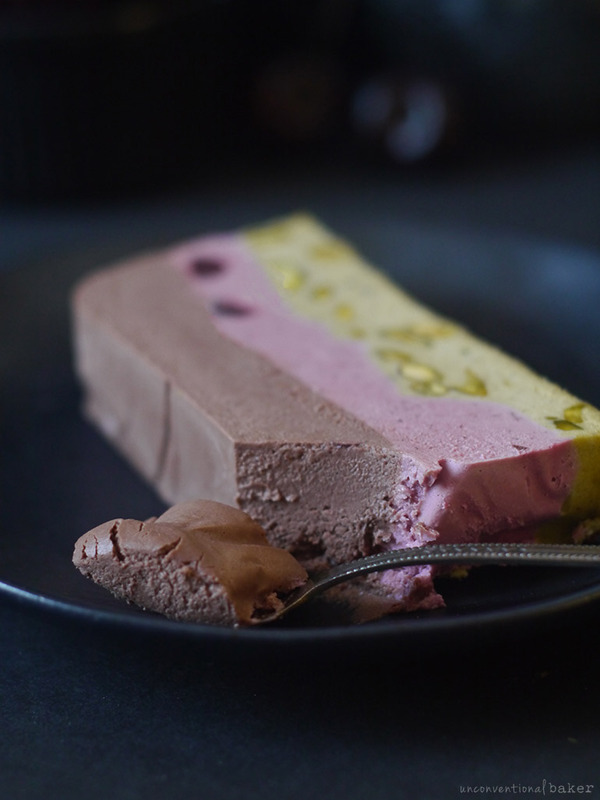 One other quick note is that apparently sometimes traditional spumoni is made by folding whipped cream into the ice cream so it’s a bit more airy. I didn’t go there because… well I like to keep things simple and this was already decadent enough. 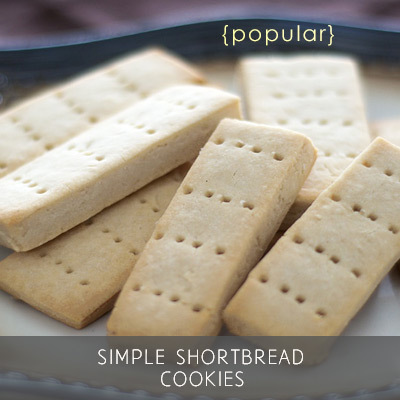 If you like a softer treat, just let it thaw out a bit longer for a creamier consistency. 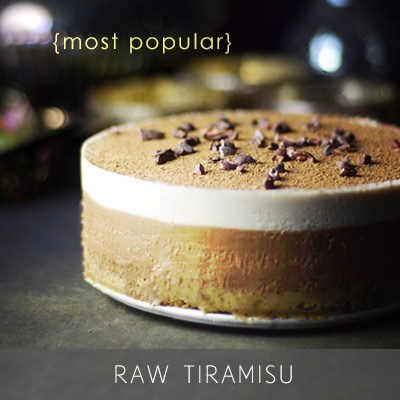 I imagine thought that if you’re determined enough to make it more “airy” you can totally fold in some dairy-free whipped cream into each layer if you prefer (just transfer to a bowl, and stir it in by hand) before putting into the mold. If you try that, I’d love to hear how it turns out. 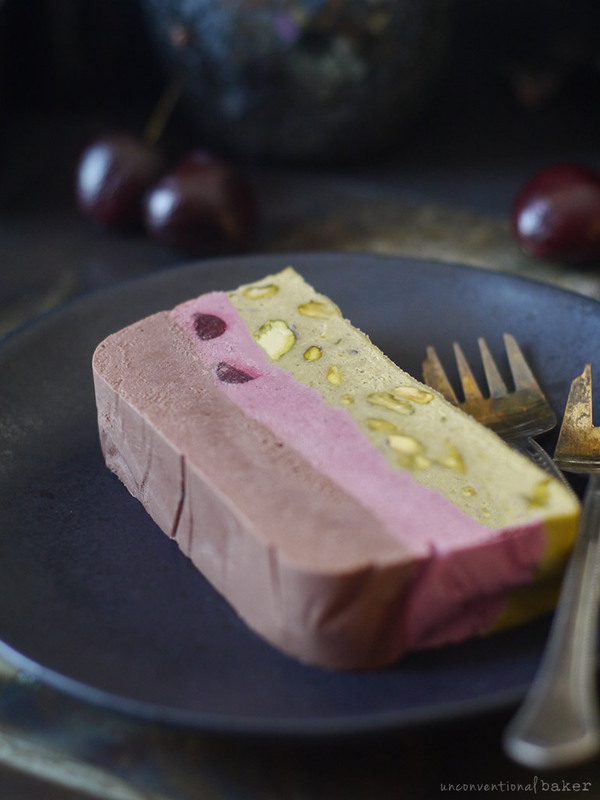 A vegan spin on spumoni — a molded Italian ice cream treat — with layers of chocolate, cherry, almond, and pistachio. ½ cup more pitted cherries (for folding in). Blend all cherry layer ingredients, except the ½ cup cherries for folding, until the mixture is completely smooth. Remove just over a ⅓ of this mixture out of the blender and set aside (you’ll need it for the chocolate layer in step 3). Add in the ½ cup cherries and pulse several times in the blender to fold them in. (Note: you don’t want to over-mix as they’ll blend into the mixture — you want to keep bits and pieces of cherry). Transfer this mixture into a parchment-lined (along the base and sides) bread loaf pan (I used one that’s 8½” x 4½”, but anything of a similar size will do). Smooth out the top with the back of a spoon and freeze for 30 mins to set. Add in the cherry mixture reserved in step 2 back into the blender. Add all chocolate layer ingredients and blend until smooth. Carefully spoon this mixture over the chilled cherry layer. Gently smooth out the top and return to the freezer to set for another 30 mins. Blend all pistachio layer ingredients, except the ½ cup pistachios for folding, in a power blender until smooth. Add the ½ cup pistachios and pulse a few times to fold in (don’t over-blend). Carefully spoon this mixture over the chilled chocolate layer. Smooth out the top with the back of a spoon and freeze for 4-5 hours or overnight to let the spumone fully set. 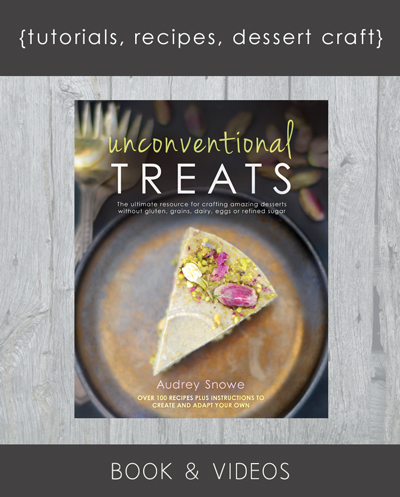 When ready to eat, thaw out a few minutes on the counter, then remove the molded ice cream out of the pan, peel away the parchment from the sides, slice, thaw out 10-15 mins for a softer texture and enjoy! Keep leftovers frozen. 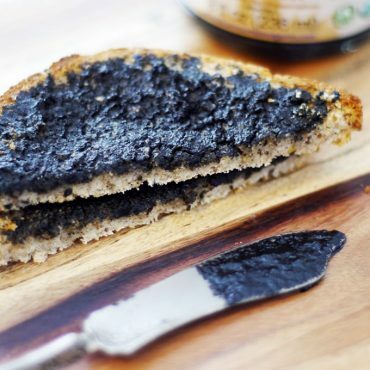 **I recommend unscented coconut oil for this recipe so as to avoid adding a coconut flavor. If you don’t mind, however, feel free to use regular coconut oil. ***Can use regular vanilla extract, but raw ground vanilla bean adds a lot of flavor so I recommend going with that if you can. If substituting with extract, use at least 1 tsp (or more to taste) per every ¼ tsp ground vanilla beans. ****If anything cold goes into the blender, the mixture will firm up pre-maturely and you’ll end up with a thick chunky mix instead of a smooth creamy ice cream (this is because of the coconut oil). So it’s important everything is at room temperature first. Disclaimer: this recipe contains affiliate links to the unscented coconut oil & raw ground vanilla bean recommended in the recipe. Thanks Janel. 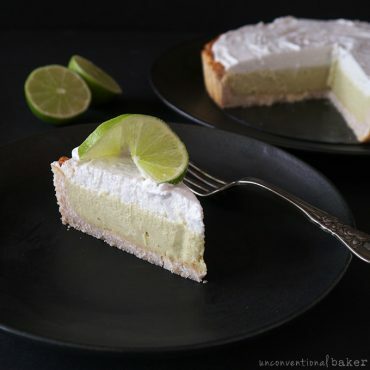 I don’t know if it will live up to the cake or whatever your childhood memory of it is, but it certainly made for a fun treat and turned out quite tasty :) Thanks so much for suggesting it in the first place.